They say that as you get older your days go by faster and faster. If that is the case I hate to see what my life is like in 5 years from now! It is going to be such a blur! hahaha I hope things will settle down soon enough, and I am sure they will. So I have been really slacking on taking pictures of all my meals. Ugh I know, SO SORRY!! So right now I am on my last week of the Reset. Thursday will be my last day! So crazy how fast it went! i have to be honest with everyone, I took a cheat day!! I know, I know, it is only 21 days, but I got a really bad cold and the thought of a salad was the farthest thing from my mine! I had some chicken noodle soup, and peanuts butter toast that day. I didn’t eat terrible, just something a little easier on the stomach. I took a picture on day 11, I have a comparison here for you!! I lost about 7 pounds so far 🙂 I only see a little difference in the picture, but I don’t think the picture does any justice! The only picture I have right now of food is day 14 or 15 dinner. 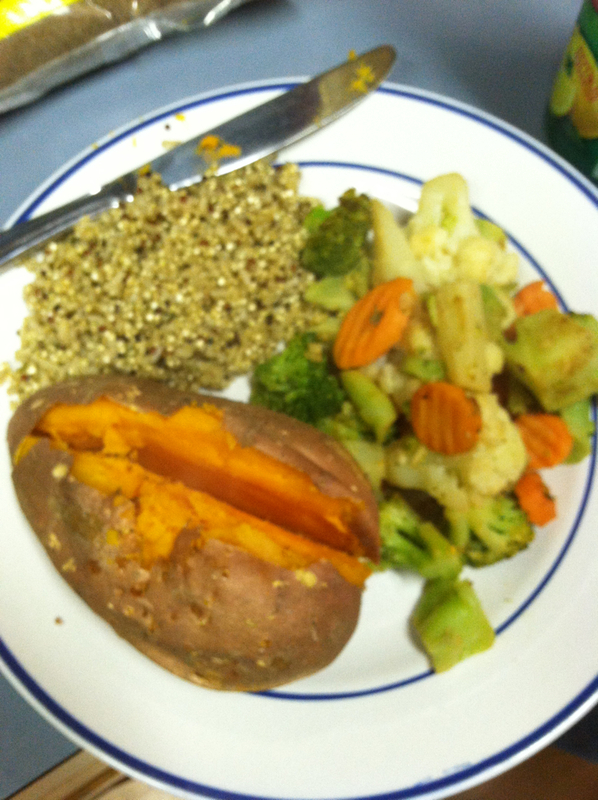 It was a baked sweet potato, quinoa, and garlic veggies! Although I do really like the reset, I will be happy when I can make my own decision on what I want to eat! I know that i can tweak the meals, but I am trying my hardest to stay as close to the meal plan as possible. I figure that they made it like that for a reason! hahaha I am starting to miss my eggs and fish! I don’t really miss the meat too much. Well I would have a Buffalo Chicken Pizza as a cheat meal, I DO miss that!! It is just hard when you are craving other healthy foods, but they are meats or dairy. But I know that this is so worth it! Why you really DON’T “have to” find out the gender of your baby.